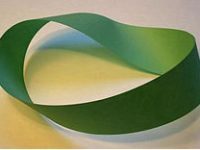 A Möbius strip is a unique geometric shape. It is the only shape where the outside surface and the inside surface are on the same continuum. See for yourself. Take a long, thin strip of paper. Give one end a half twist and then tape it together. It should look similar to the picture above. What you now have is a one-sided, one-edged piece of paper called the Mobius strip. To see that it has only one side, try drawing a line along one side and continue until you end up where you started. You will see that the continuous line is on both the inside and the outside of the strip with no break; seamlessly. Your brand should function like the Möbius strip. Your brand should and can be so much more than the promise you make to your customers and prospects in your advertising, social media and all of your collective external marketing messages. Your brand can also be an internally unifying concept that helps your employees understand their individual roles in contributing and reinforcing your brand promise. More than marketing communication, you can use your brand to define your company culture and guide the organization, the people and the processes. When you think of your brand, don’t go halfway. Think of the Möbius Strip.